This was my second attempt at a scratch-built wing. 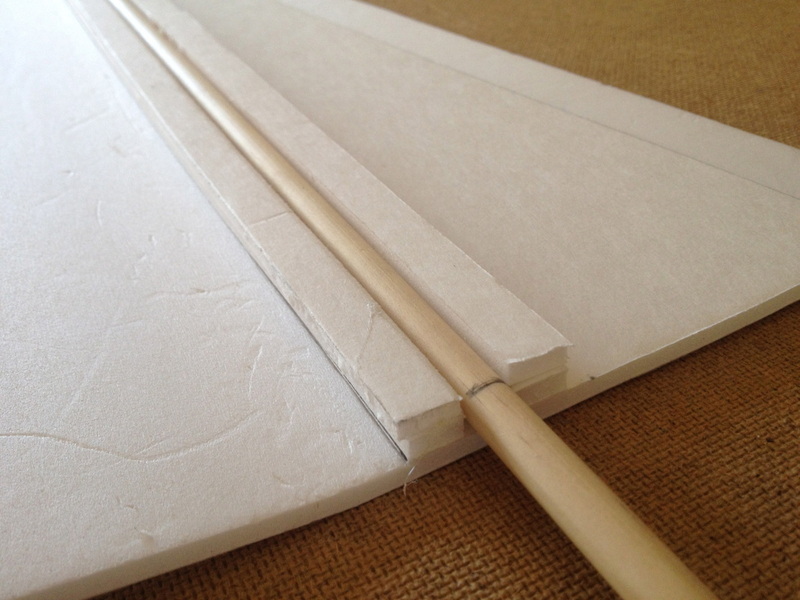 Using the techniques I learned from Ed at Experimental Airlines, I created my own forward-tapered design using foam board, hot glue and packing tape. I wanted the wings of this plane to resemble the wings of a sailplane and that meant it needed to have a high aspect ratio. An aspect ratio is basically the ratio of the wingspan squared, divided by the total wing area. Based on some rough calculations and looking at what I could do with foam board I opted to design the wings with an aspect ratio of 16. This meant my root chord would have to be 6" and the tip chord 1.5" with a span of 30" between the two. Note: The design idea behind this wing was inspired by the Armin Wing, from Ed at Experimental Airlines. He has some great instructional videos on the Armin Wing available here. The main material behind this build is Dollar Tree foam board. 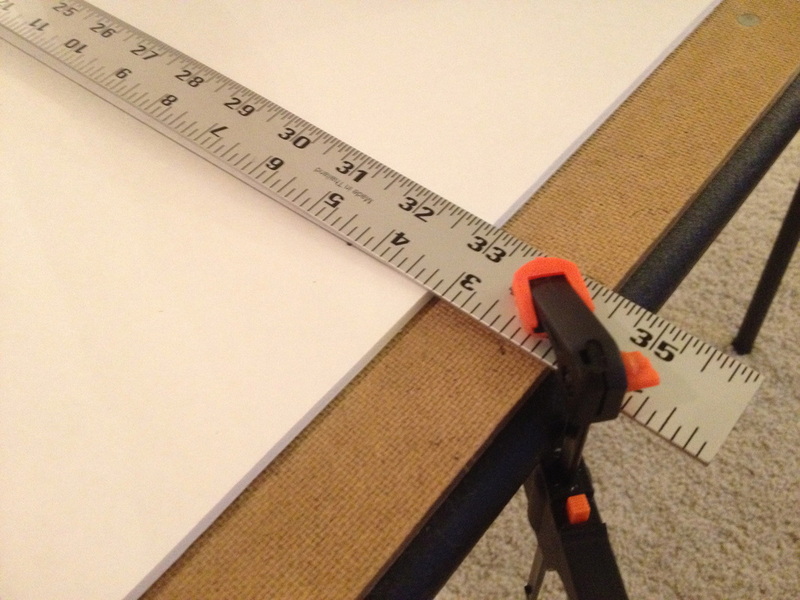 It was purchased at the Dollar Tree for $1 per sheet and measures 20" x30". 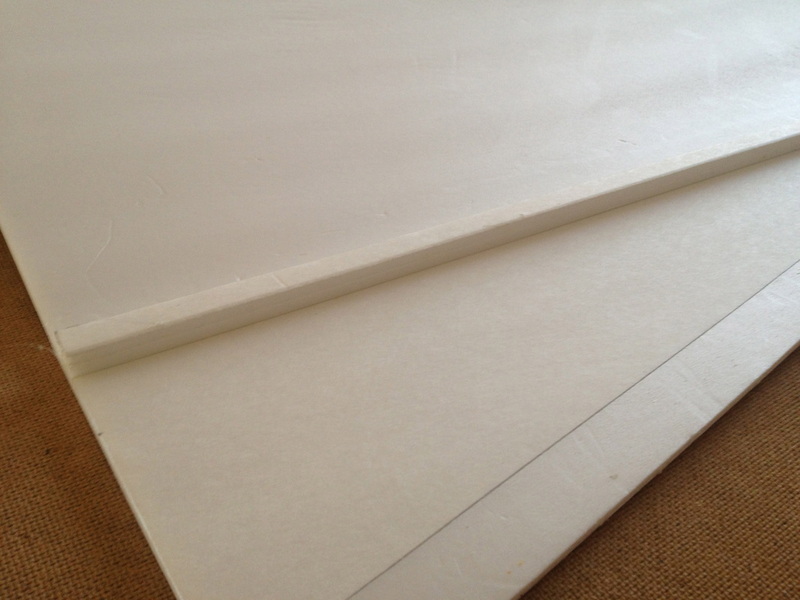 First, I laminated the surface of the foam board in packing tape by following instructions at this video here. 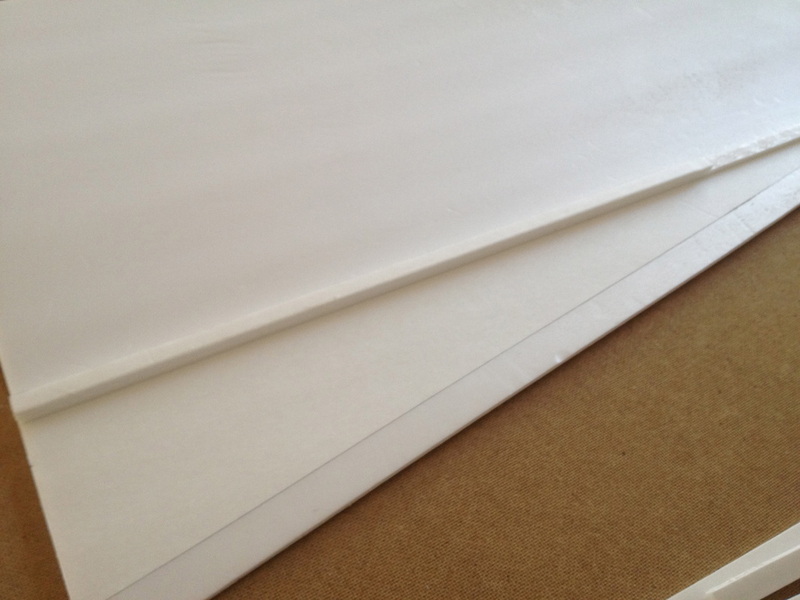 The process began by laying one strip of packing tape lengthwise along the foam board. 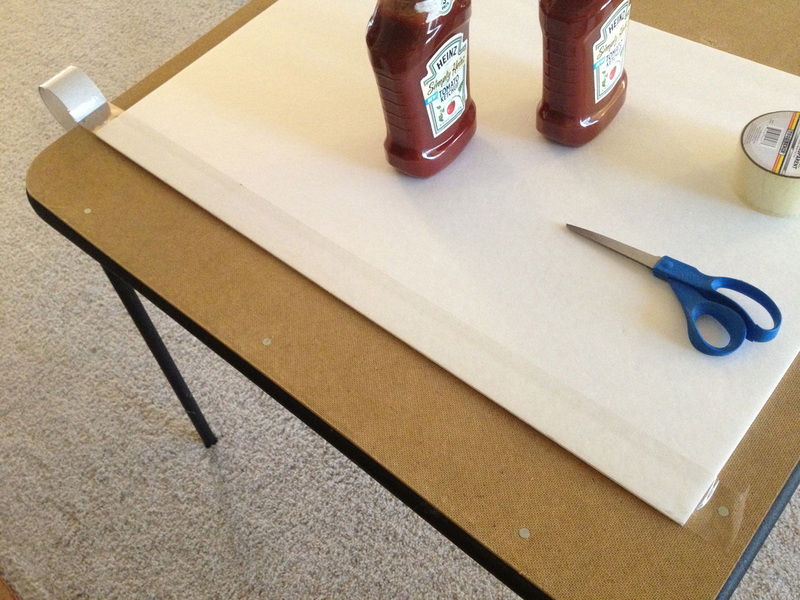 The board I was working with was slightly warped, so I used some ketchup bottles to hold it in place for the laminations process. 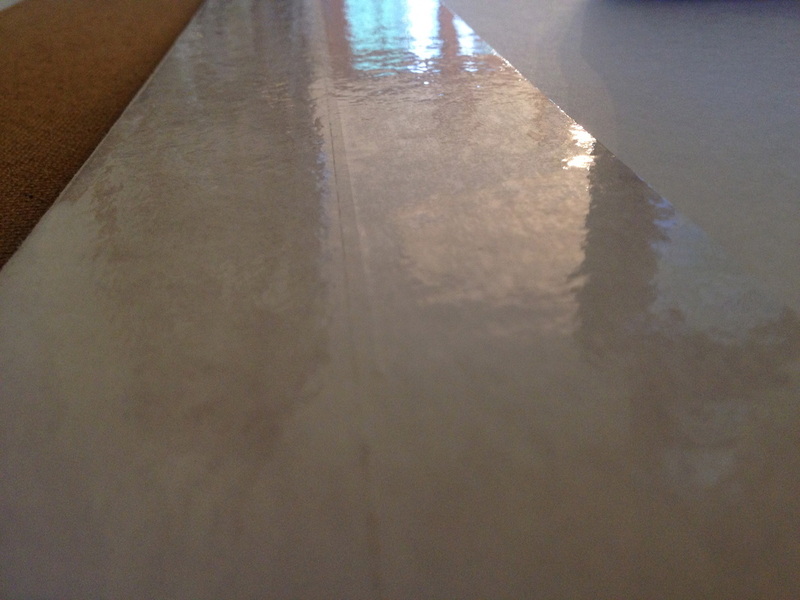 The next strip of tape was applied adjacent to the first strip, but slightly overlaps it by 1mm to 2mm. 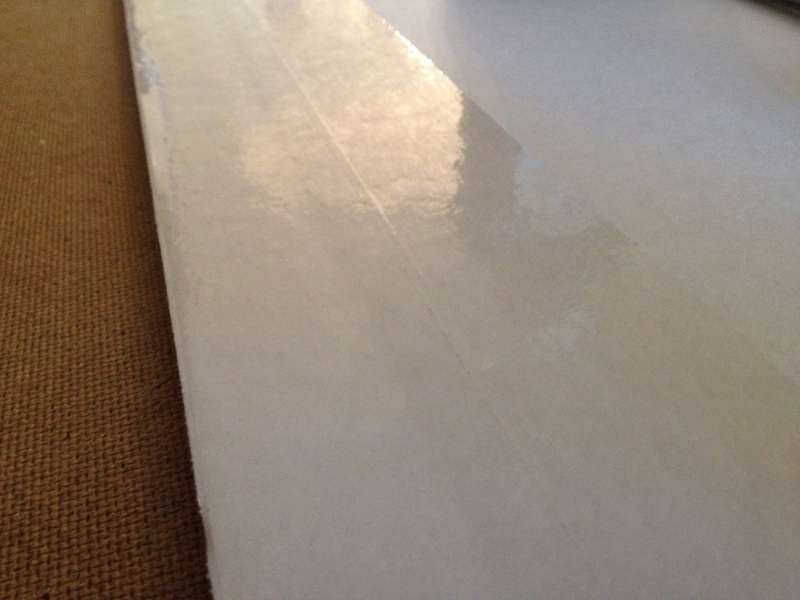 I had to pay careful attention in order to ensure the tape laid flat without wrinkles. 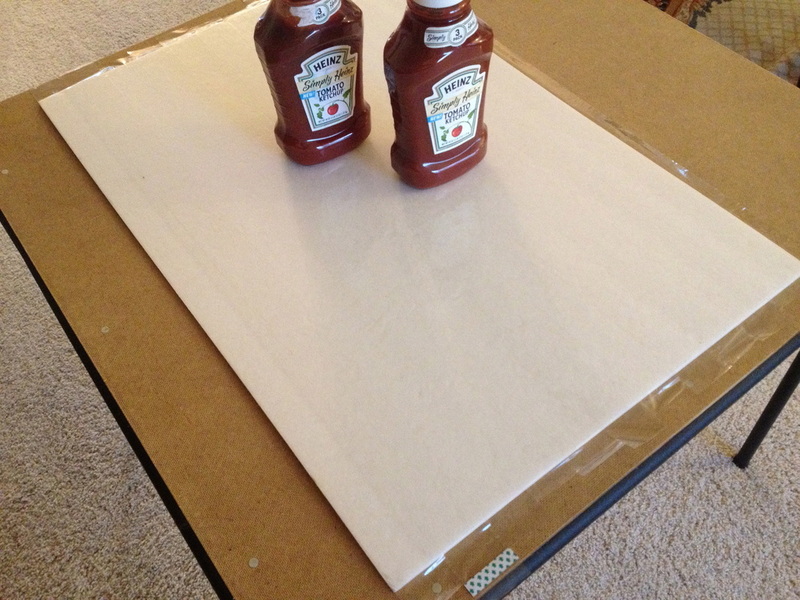 Once the whole board was covered in tape, it looked like the pictures below. 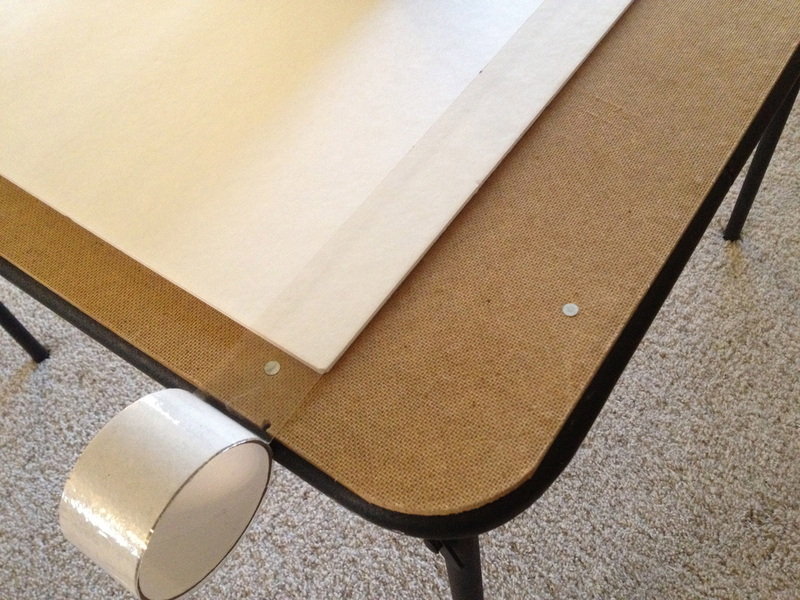 With tape hanging off 3 of the edges of the foam board. 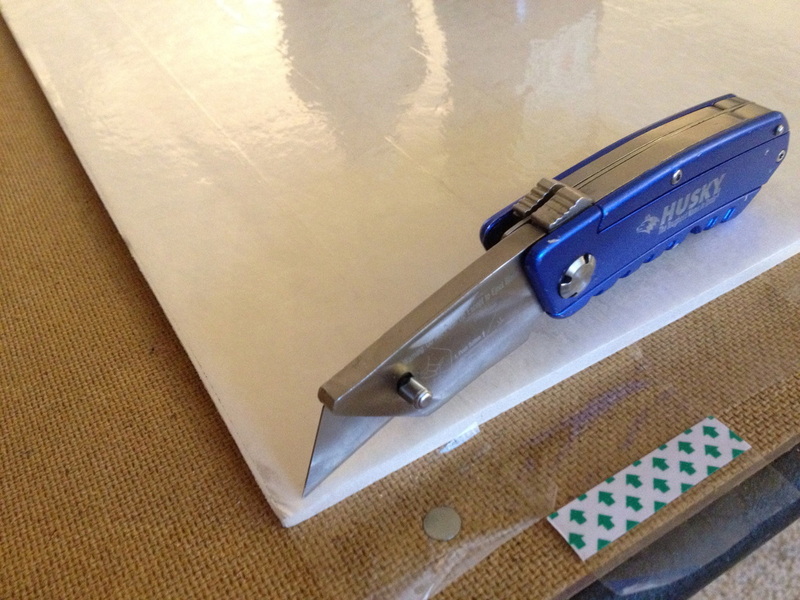 Next, I took my box cutter and trimmed off the 3 edges with excess tape. 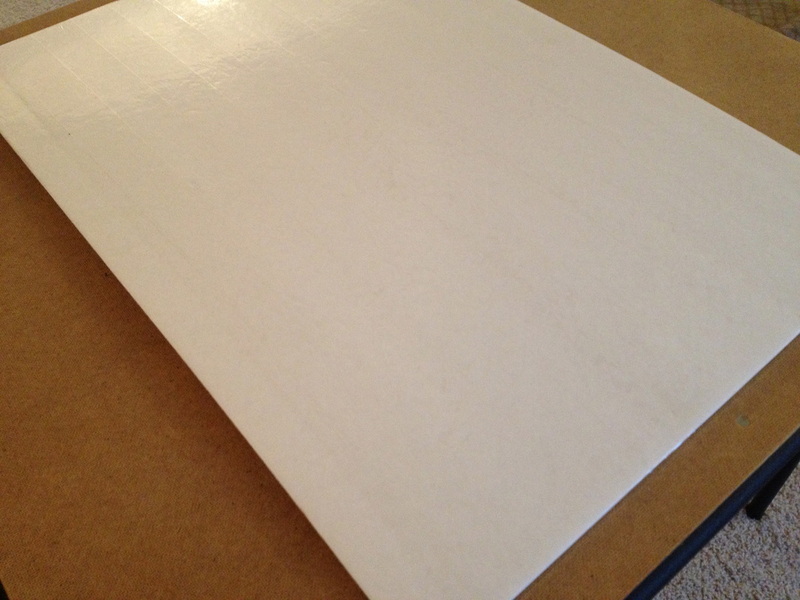 Leaving a clean laminated surface on the foam board. 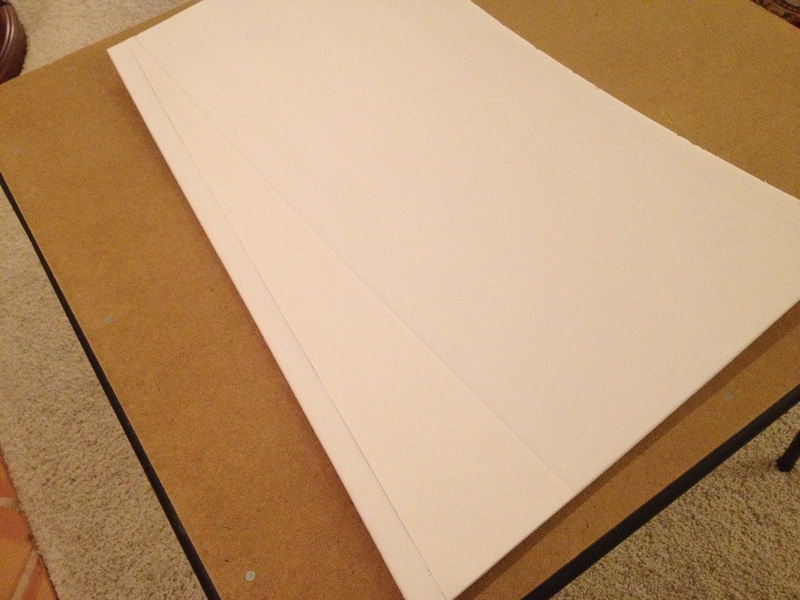 Once the board was completely prepped and laminated, I flipped it over onto the un-laminated side and began drawing my template for the wing. 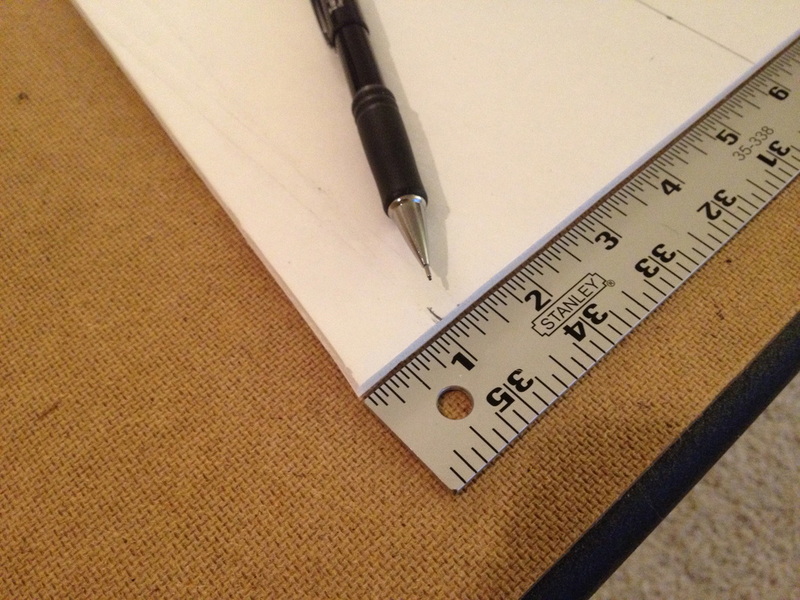 I started by marking a spot 6 inches up along one of the 20" sides. I repeated the same mark on the other 20" side and then connected the two with a long line across the board. 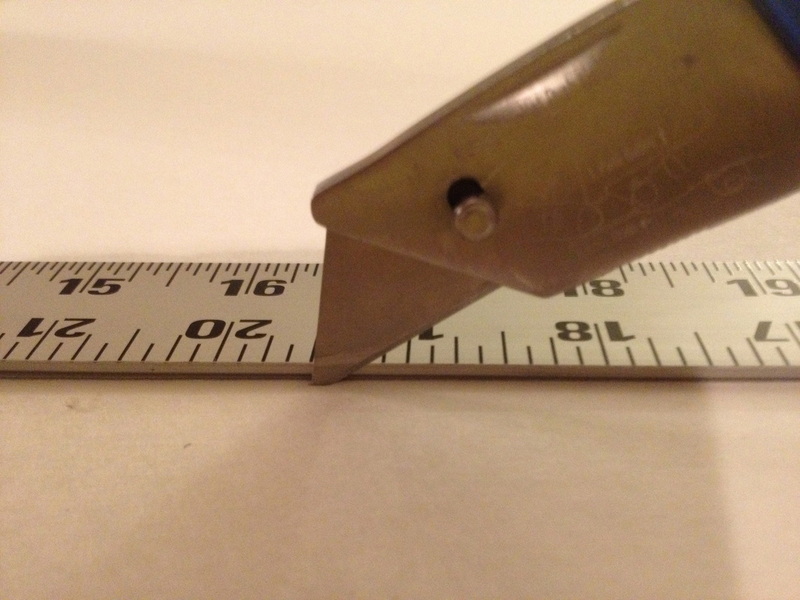 Next, I took the ruler and measured 1.5 inches down from the 6 inch line I had just made. 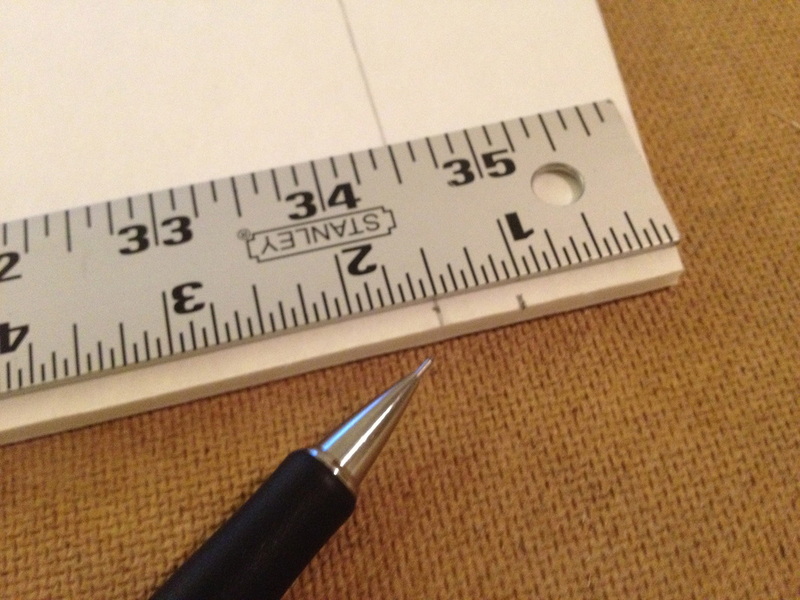 This 1.5 inches is the size of the tip chord. 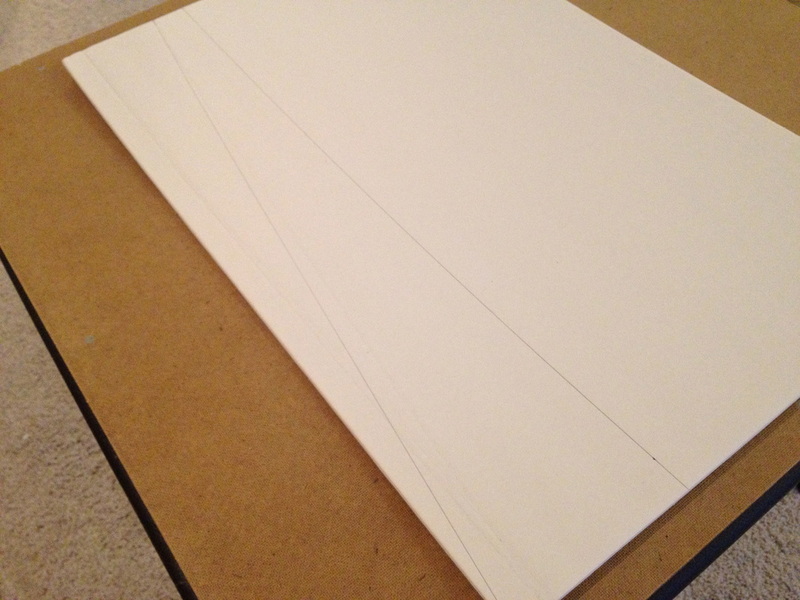 I then drew a line connecting the mark at 1.5 inches to the opposite corner of the foam board. You may notice the shape of the wing is starting to emerge. 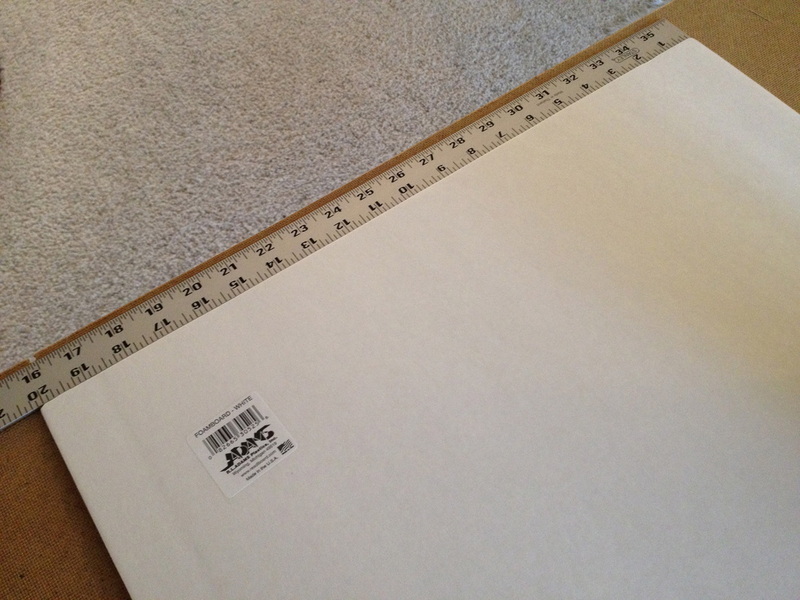 Then, using my box cutter and my ruler as a guide, I proceeded to cut along the line I had just made and remove the unnecessary section of foam. 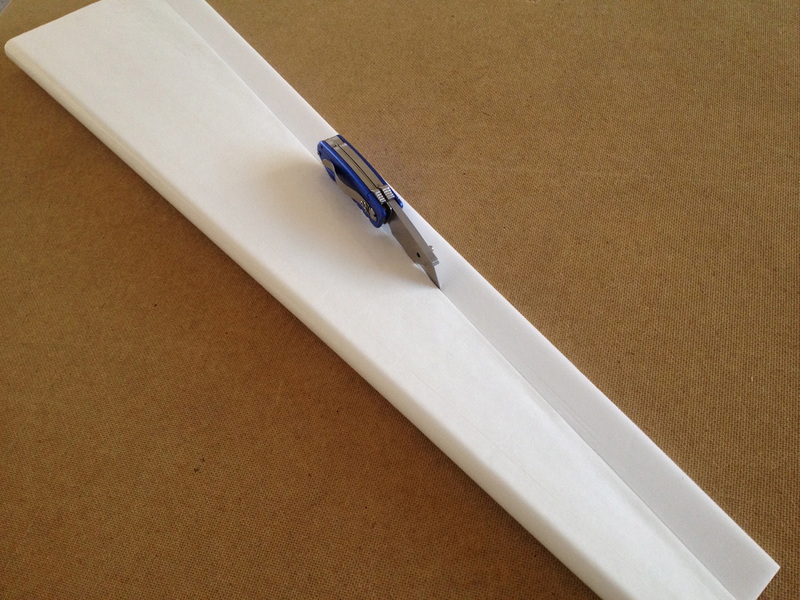 Next, I needed to mark the place where the top of the airfoil would meet the bottom of the airfoil. 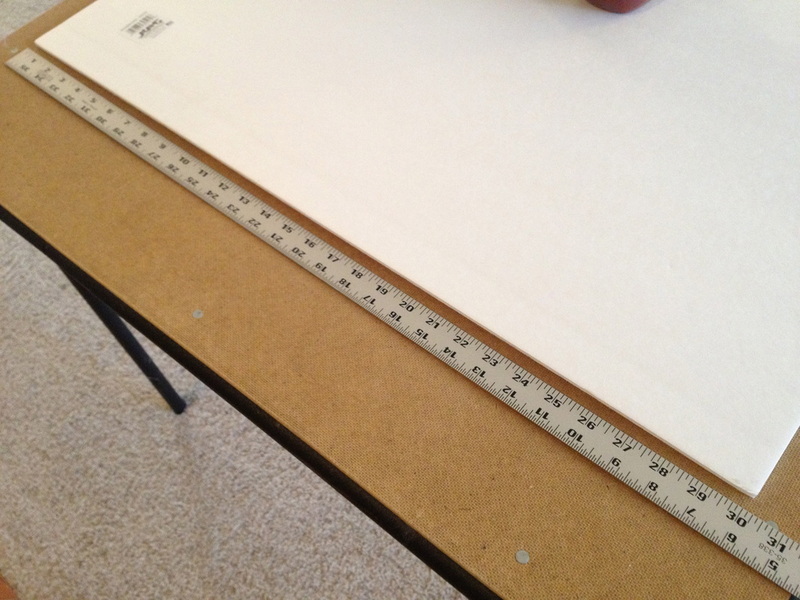 I started by marking a spot 1" up from the bottom right corner of the foam board (the corner with the longer side). 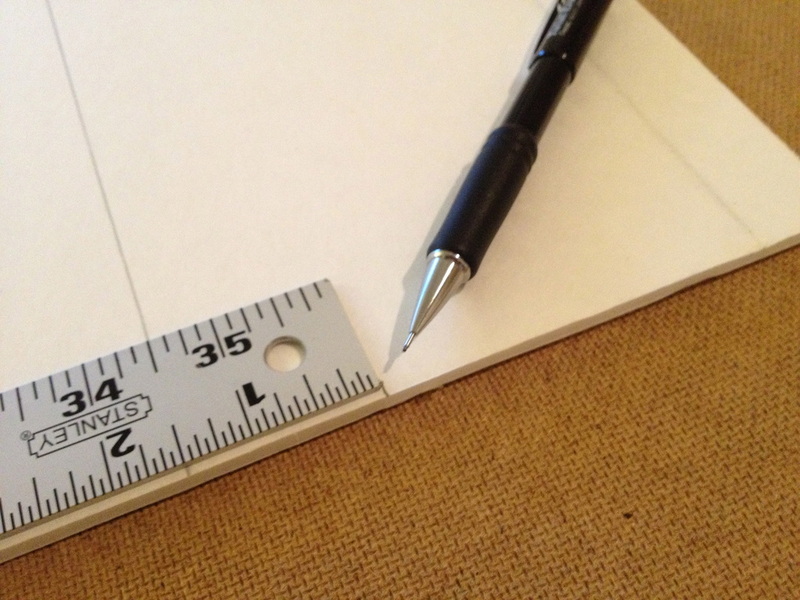 Then, on the shorter side I placed a mark 0.5" below the 6" line I had drawn earlier. Once these two marks were made, I drew a line connecting the two of them. 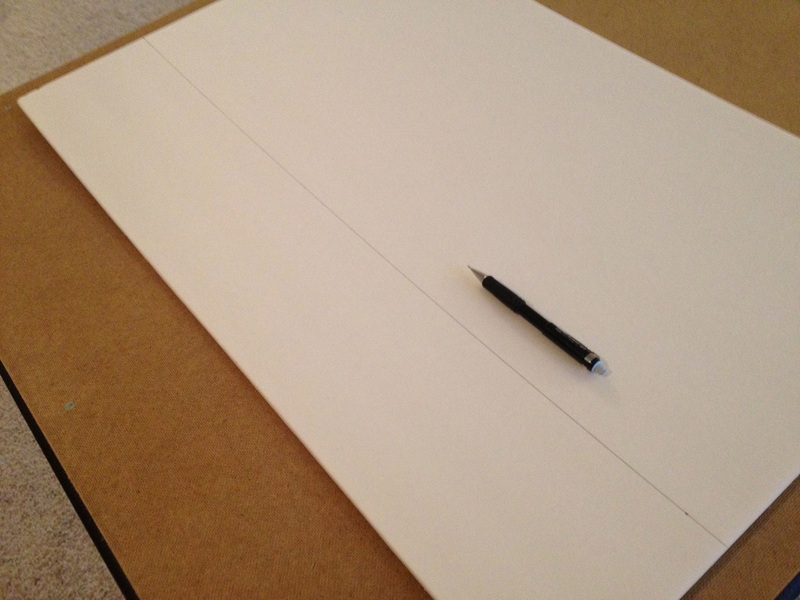 At this point, the foam board had two lines drawn on it forming a thin, long triangular shape. 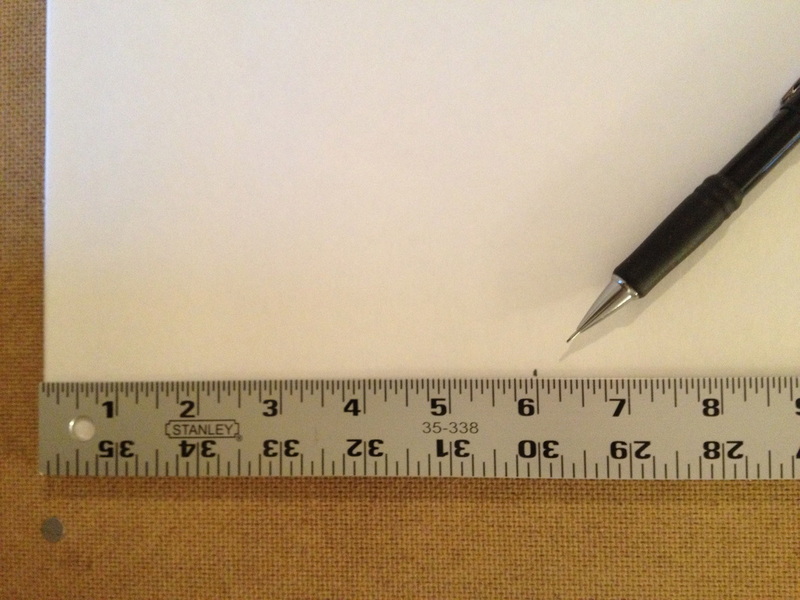 These two lines needed to be scored so that certain sections of paper could be removed. 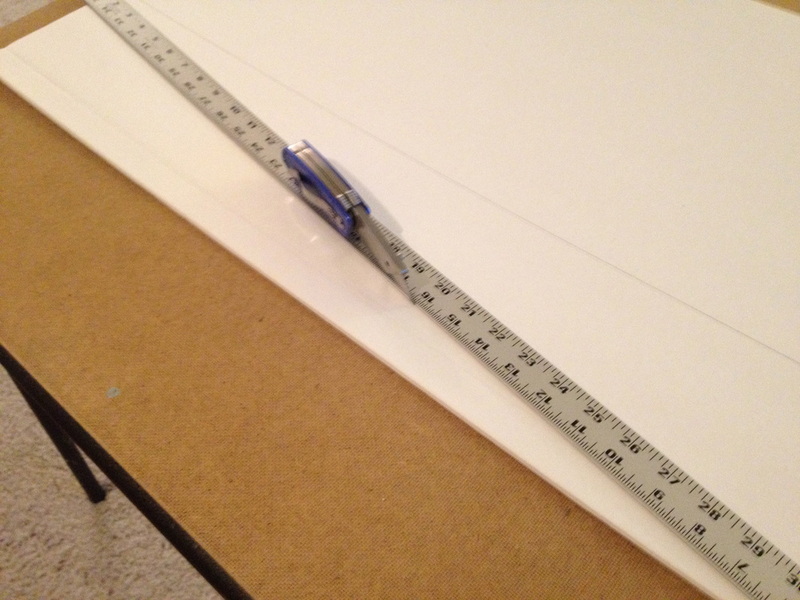 In order to score these lines, I started off by placing my ruler across the line and then clamping it on both sides. 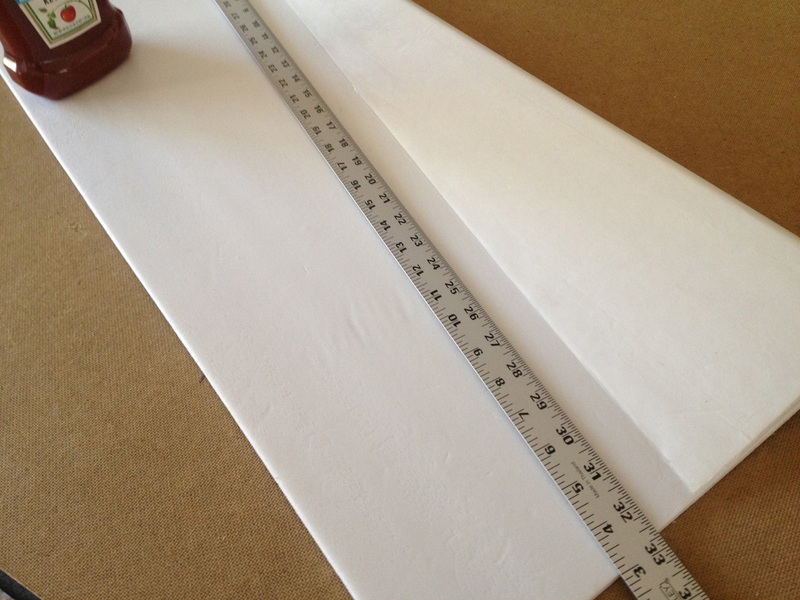 Once the ruler was clamped I ran my box cutter along the side of the ruler while only partially penetrating the foam board with the tip of the blade. 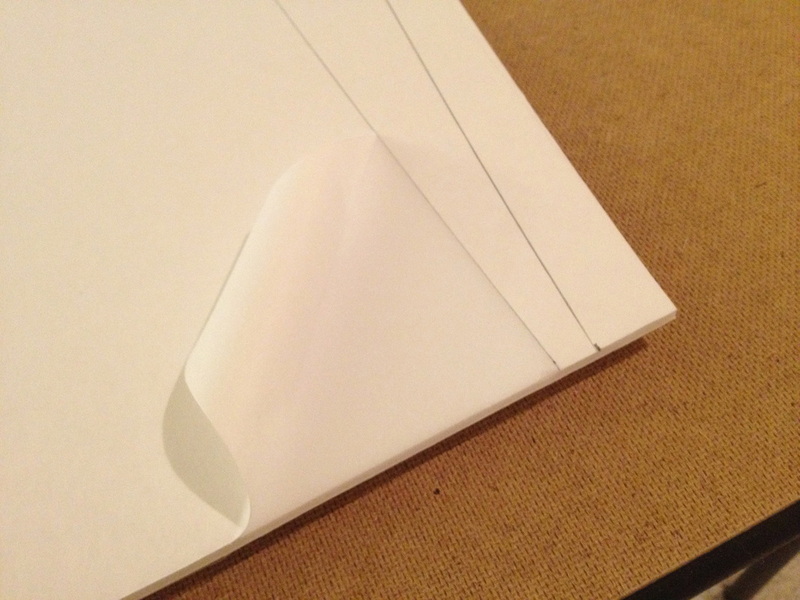 The objective here was to only cut through the top layer of paper so that it could be peeled off afterwards. 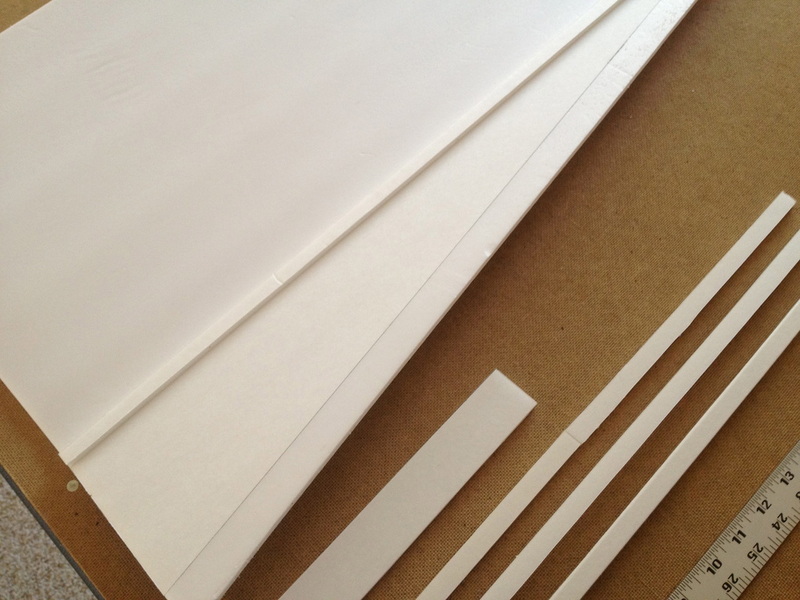 After the first score was made of the 6" line, I started to peel off all the paper that was above the line. 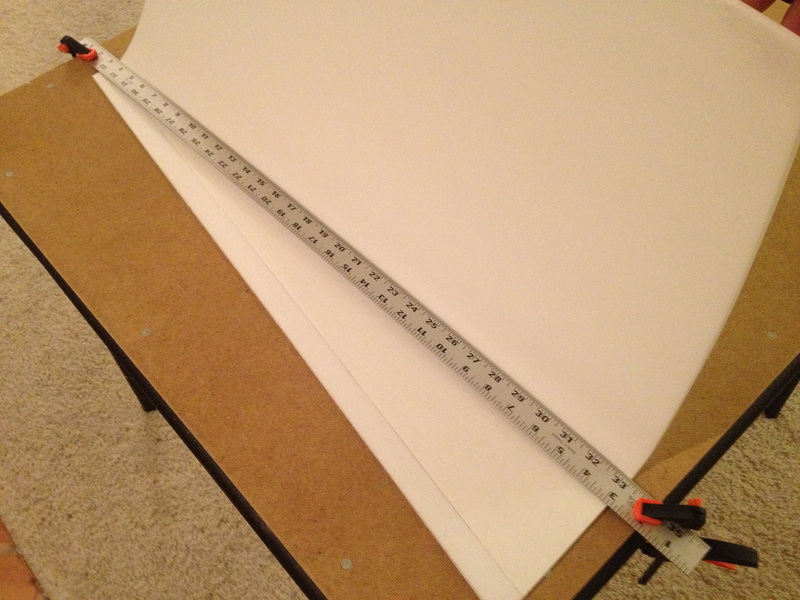 Next, I scored the diagonal line that I had marked earlier and then peeled off the paper that was below that line. The end result looked like the second picture below. 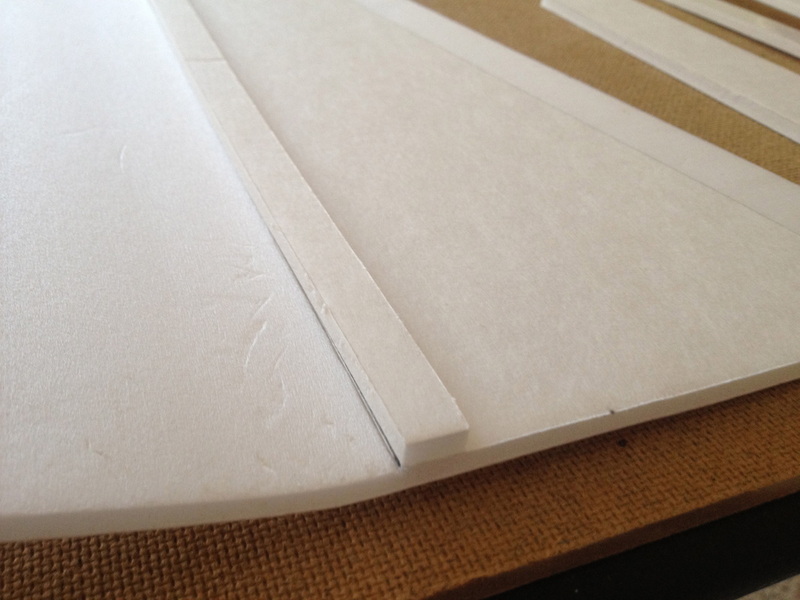 A thin triangular section made of paper, surrounded my bare foam. 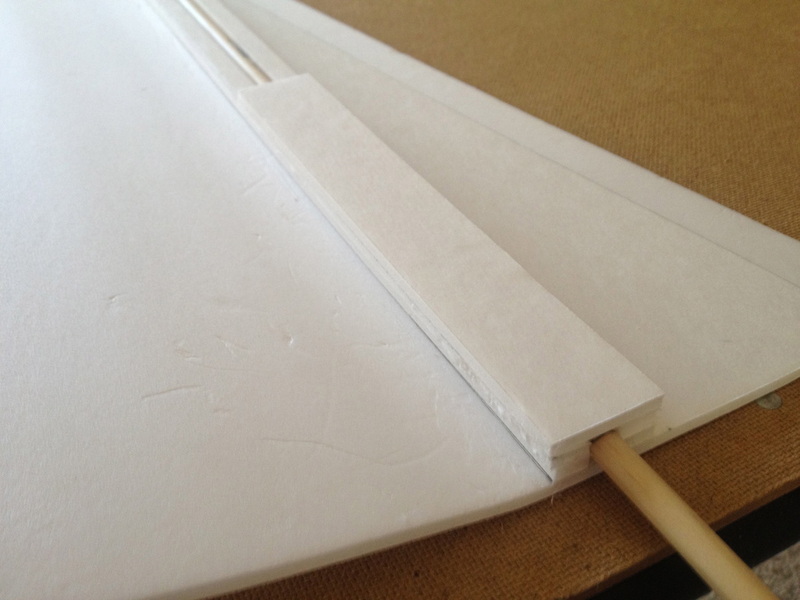 Now that all the initial scores and cuts had been made, the top of the airfoil needed to be folded back onto the bottom of the airfoil. 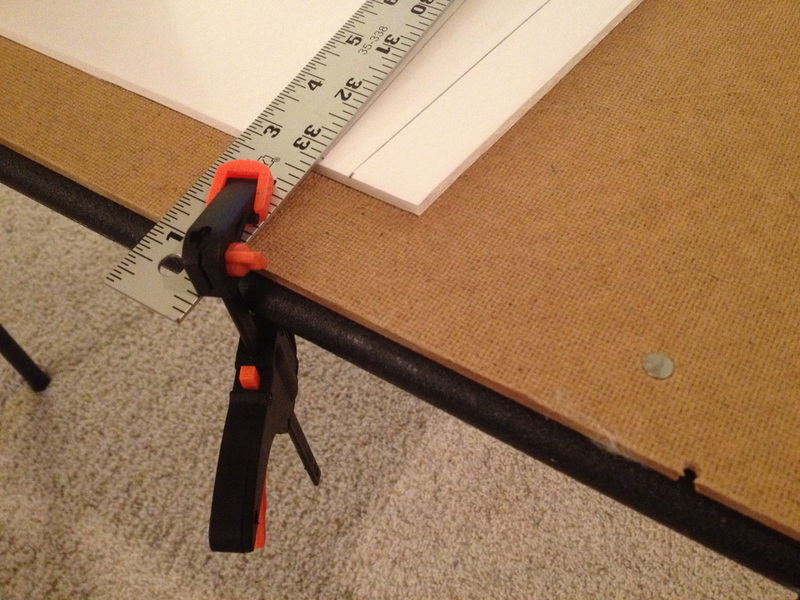 In order to do this I placed my ruler along the 6" line and clamped it just like I had done for the scoring process. 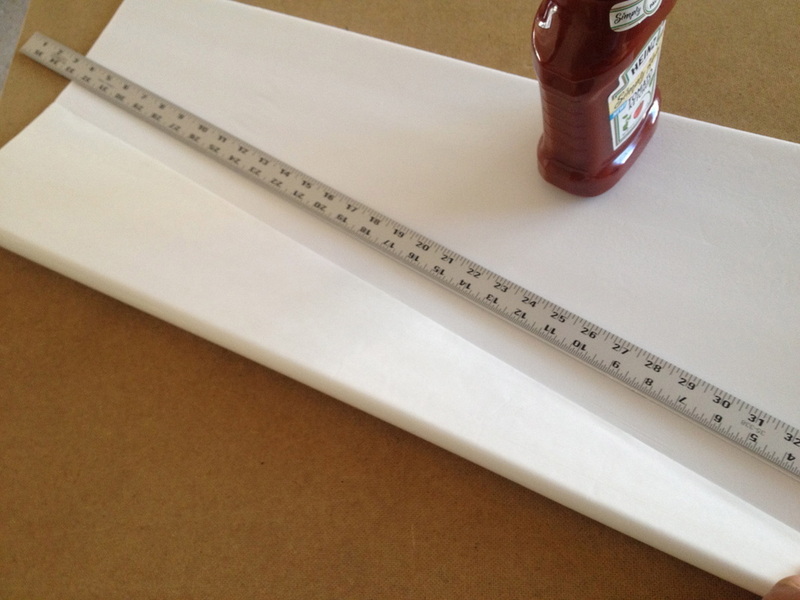 Once the ruler was clamped, I held the bottom of the airfoil with my left had while I used my right hand to fold the top half over the edge of the ruler. The next thing I needed to do was lay the formers that would hold the shape of the airfoil while simultaneously housing the wooden spar. 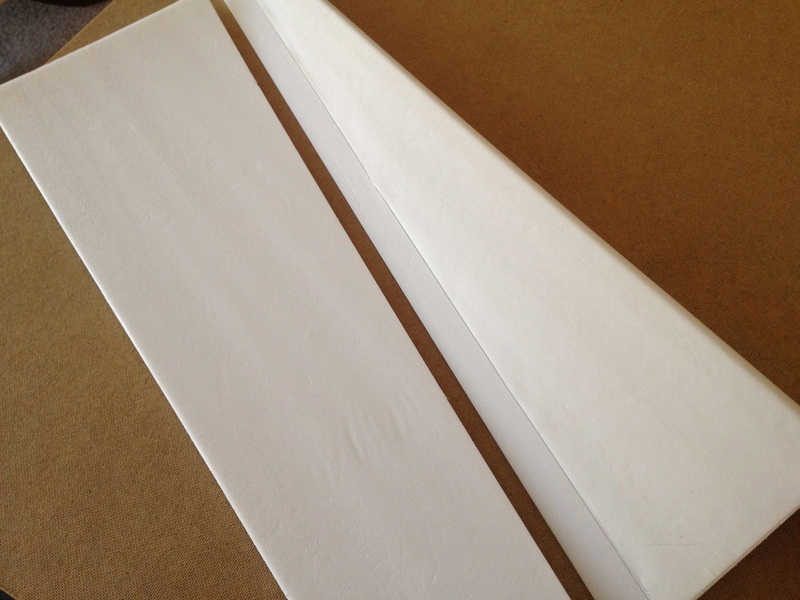 The formers that I needed for this airfoil included: 1 Strip of 0.5"x30" Foam Board, 3 Strips of 0.5" x 20" Foam Board and 1 Strip of 1.375" x 10" Foam Board. 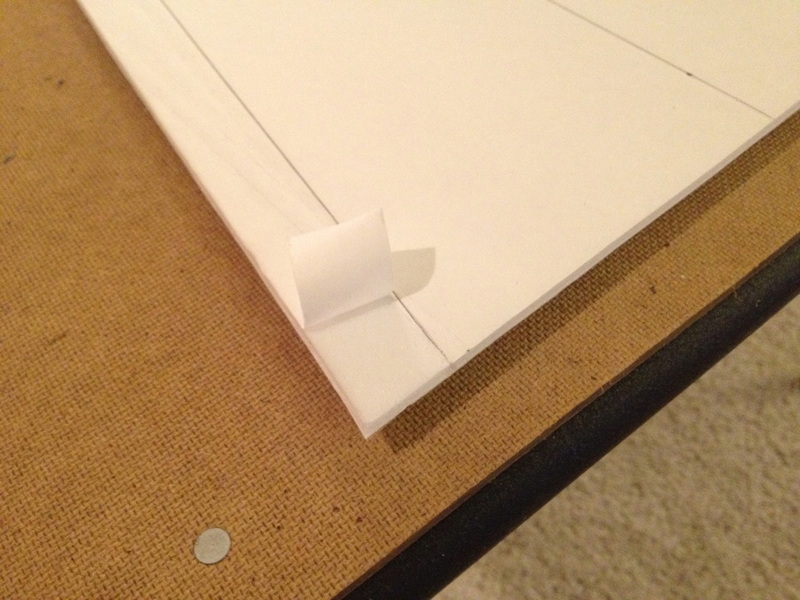 First I laid the 30" strip along the edge of the white paper, right where I made the fold in the previous step. I used hot glue to hold it down. 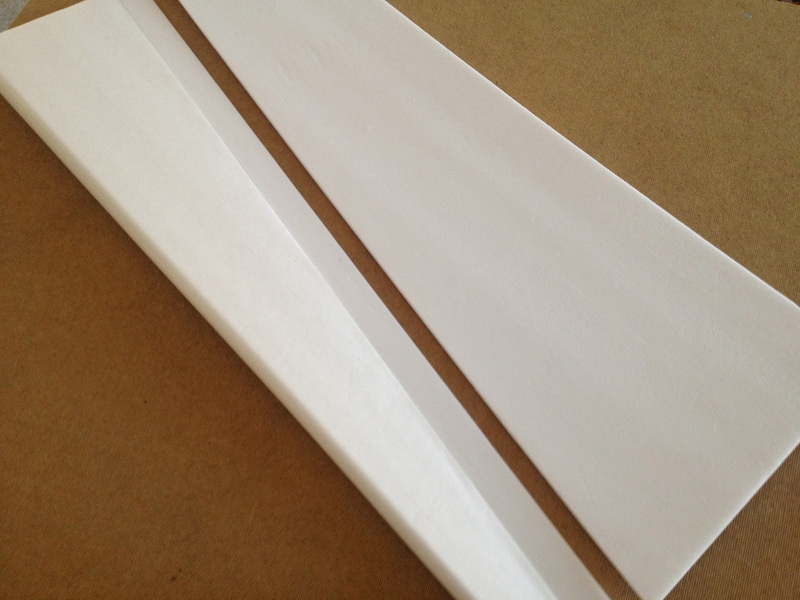 Next, I laid one of the 20" strips right on top of the 30" strip and lined it up with the inside edge of the wing (the 6" side). I used hot glue to hold this down as well. After that piece was glued down, I took the wooden spar I was going to be using and lined it up behind the two already-glued pieces. 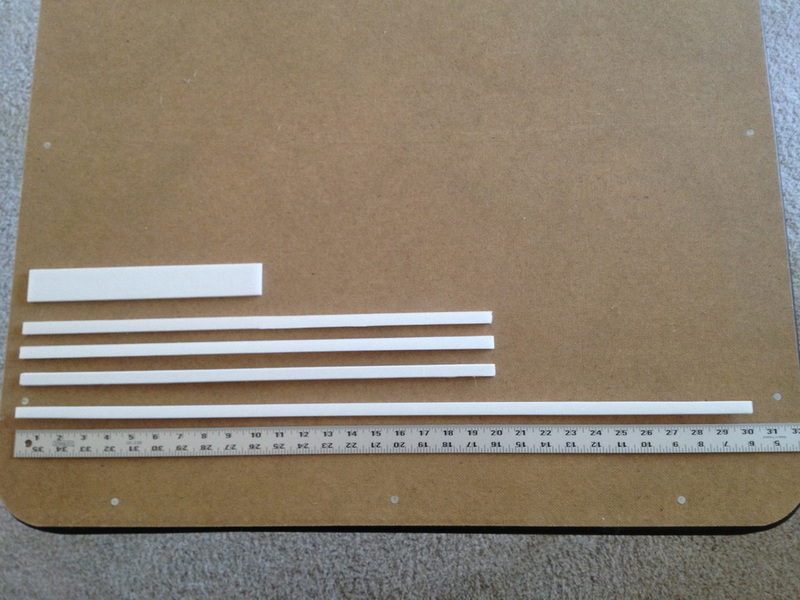 Then I took the last two 20" strips and glued them directly behind the spar - one on top of the other. 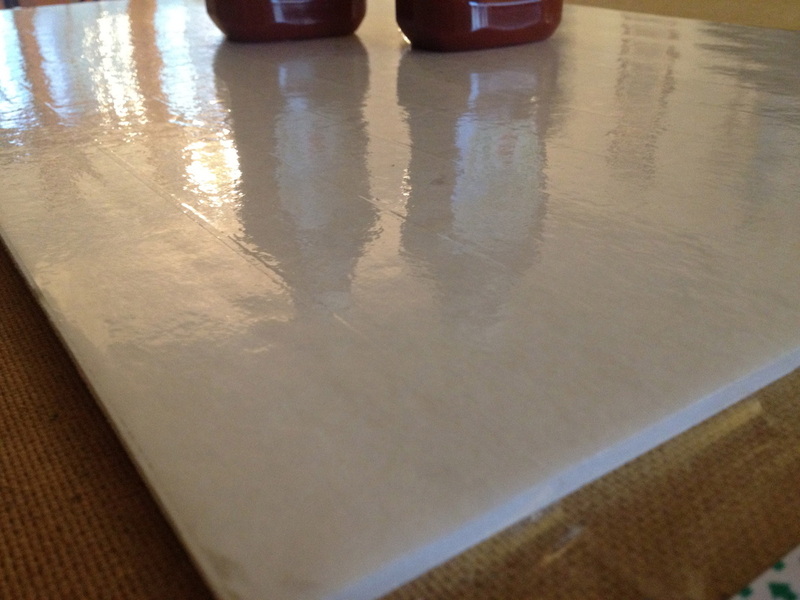 Once again, I lined these pieces up with the inside edge of the wing. 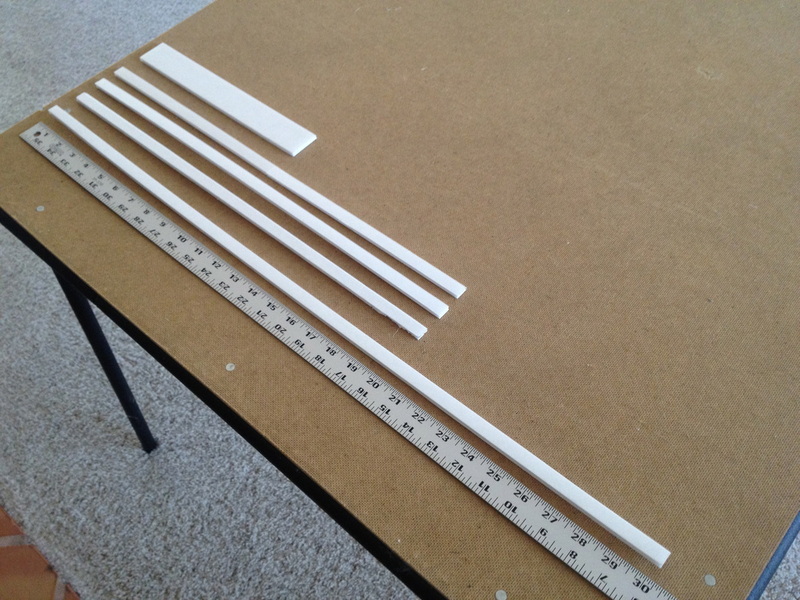 The last step for creating the former was to glue the 1.375" strip across the two 20" strips, encapsulating the wooden spar inside. Gluing this last former into place while the wooden spar was inside helped ensure a tight fit for the spar. The complexity of this wings former is due to the fact that wing tapers. Having a smaller airfoil at the tip chord than the root chord meant that the former not only needed to taper in a horizontal manner but also in a vertical manner. The next step was a little difficult to complete while simultaneously taking photographs, so I hope the pictures below suffice. 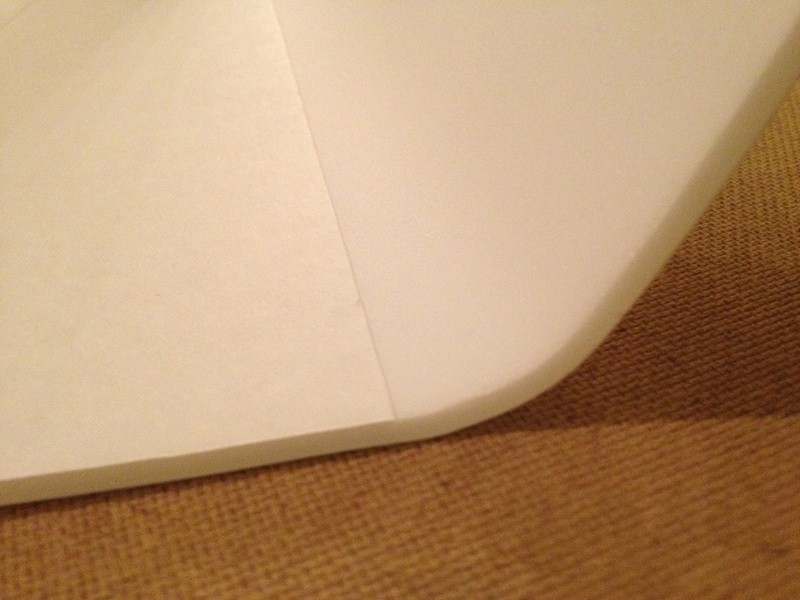 I folded back the the foam board along the edge of the paper, like I had done a couple steps above. This time, however, I applied glue to the top surface of the formers and folded the foam all the way back until it made contact with the formers. 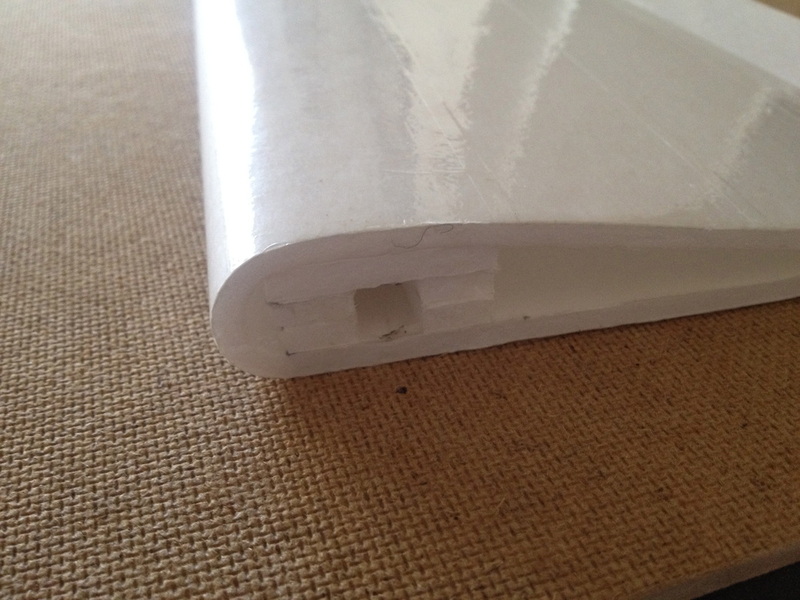 This established and held the airfoil shape of the wing. 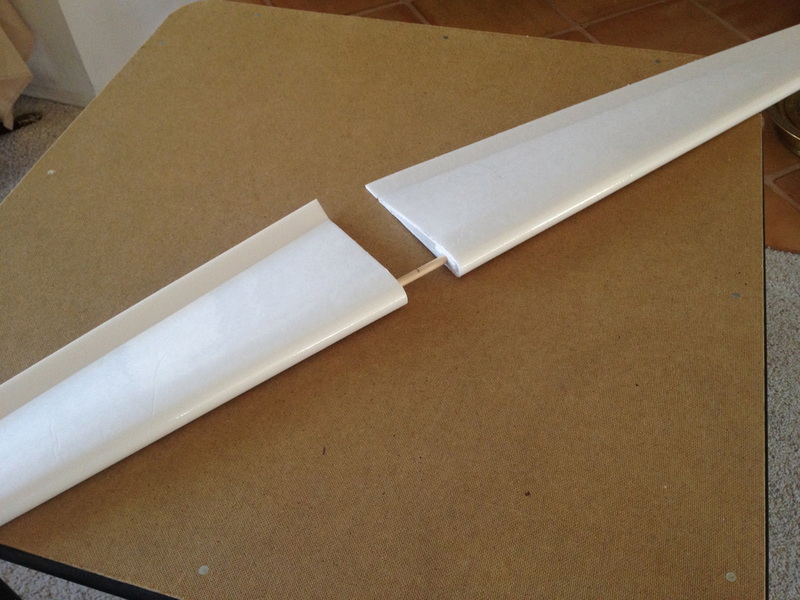 After the glue dried, it was time to cut the control surfaces out of the wing. 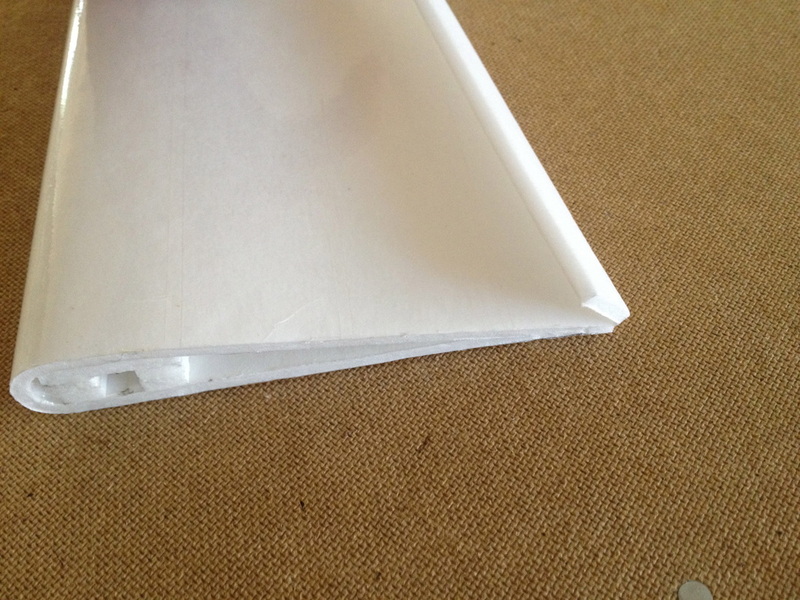 The pictures below are of the bottom of the wing after it ad been folded and glued. To make the control surfaces, I took my ruler and made a parallel line about 1" away from the bottom trailing edge of the wing. 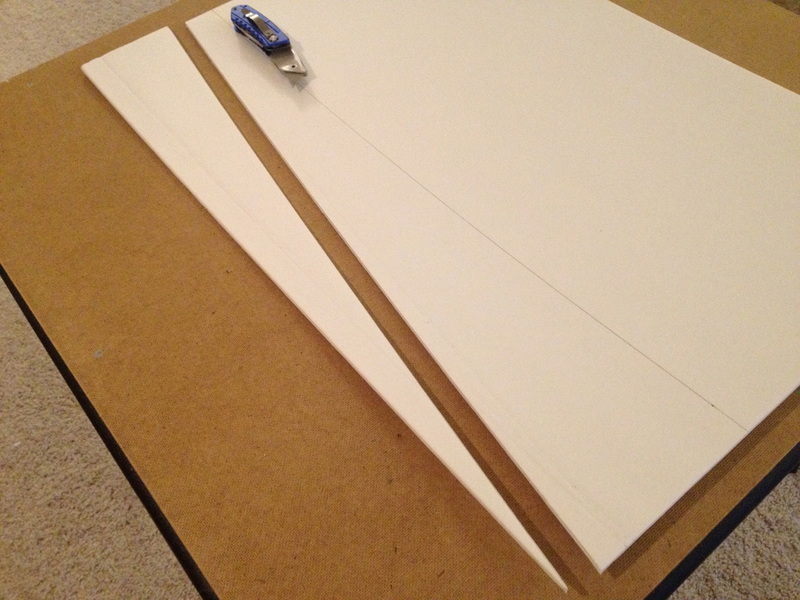 Using my exacto, I cut away the rest of the foam. 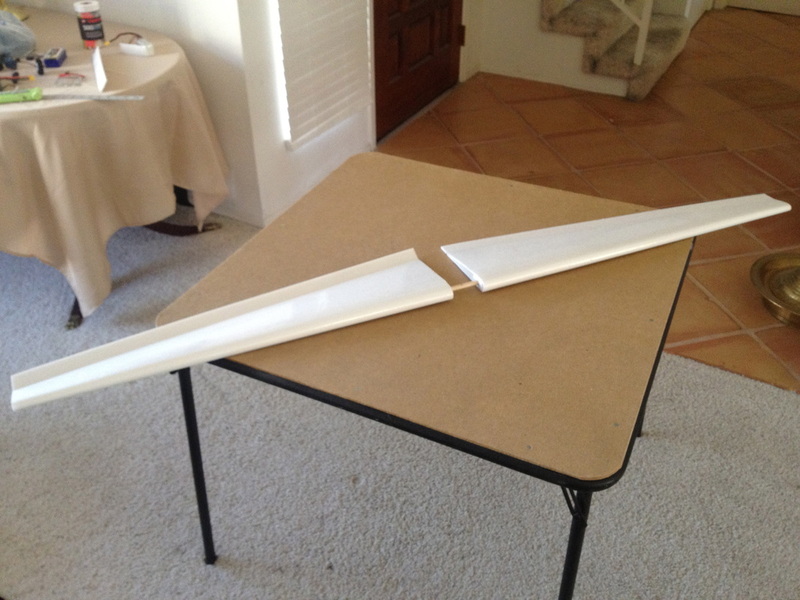 All that was left was the wing with it's 1" wide control surface. 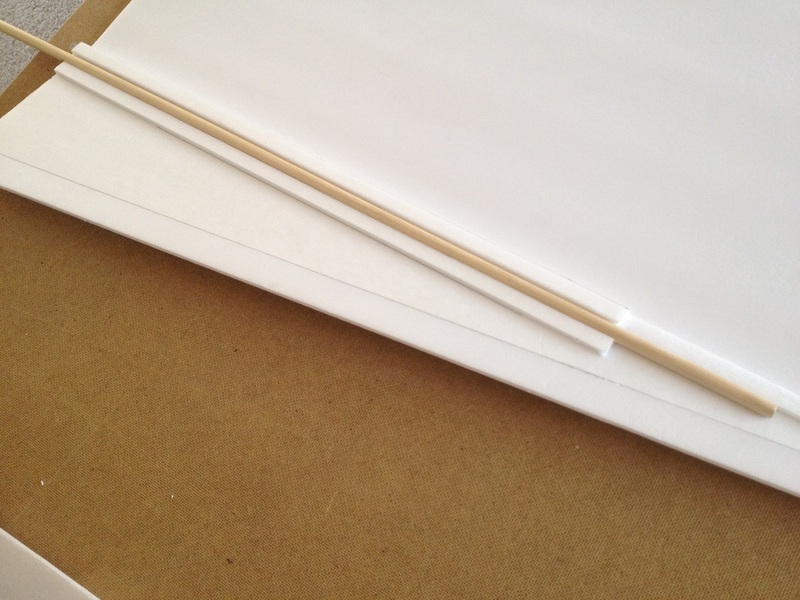 Next, I needed to free up my control surface so that it could bend. 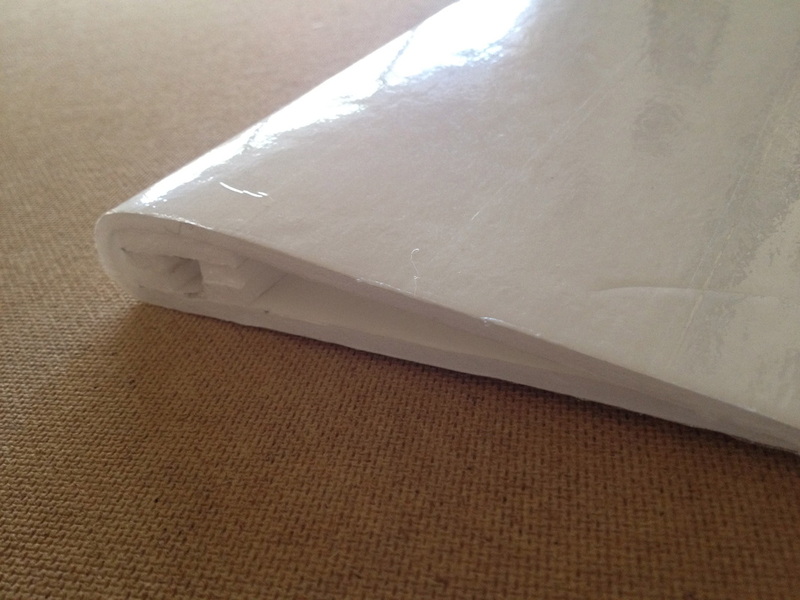 I took my exacto and scored the edge of between the bottom edge of the wing and the control surface. After the score was made, I bent the control surface back and forth - making sure it was indeed moving freely. This was the last step of making the wing. After I had finished one wing, I repeated the step for the other wing with certain measurements being mirrored over from left to right. 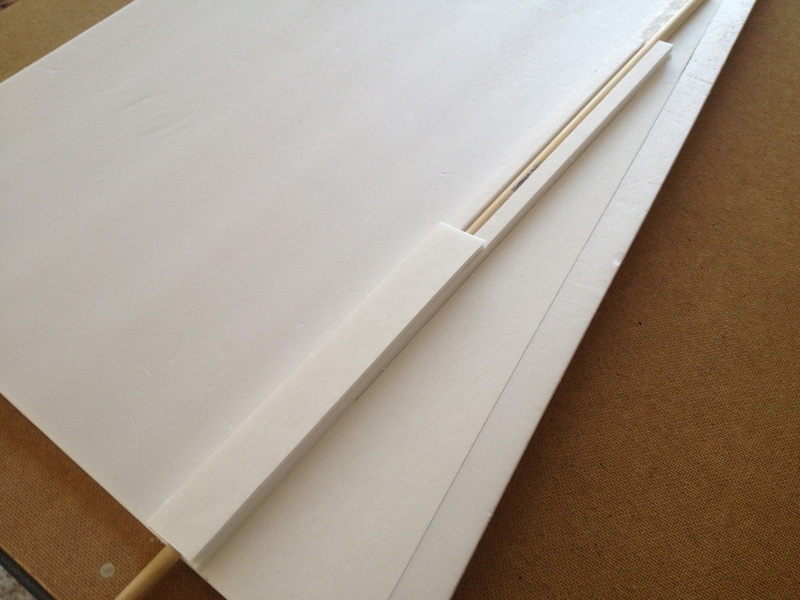 Once the second wing was finished I joined the two together with the wooden spar and...Voila! A finished 60" forward tapered wing.